Is it important to be connected? Well, consider this: If Facebook were a country, it would have the largest population in the world… by a lot. Through the use of timely case studies and fascinating stories, Six Pixels of Separation offers a complete set of the latest tactics, insights, and tools that will empower you to reach a global audience and consumer base - and, best yet, you can do this pretty much for free. Innovation expert Mitch Joel unravels this fascinating world of new media - but does so with a brand new perspective that is driven by compelling results. The smarter entrepreneurs and top executives are leveraging these digital channels to get their voice "out there” - connecting with others, becoming better community citizens, and, ultimately, making strategic business moves that are increasing revenue, awareness, and overall success in the marketplace - without the support of traditional mass media. Everyone is connected. Isn't it time for you and your company to connect to everyone? Six Pixels of Separation will show you how. "In today's world of constant Twittering, pinging, poking, and Facebooking, connecting your business to your customers is essential. Trouble is, the old rules won't help you much. Today, as Mitch Joel explains in this terrific book, survival depends on creating real value, speaking authentically, and building trust. For anyone looking to understand the new media landscape, Six Pixels of Separation is the ultimate guidebook." "First, there was a gulf, then a chasm, then a gap. Now, of course, there's nothing in the way of making the connection. Mitch takes you on a detailed, fun tour of what it means to connect online - with your customers, your colleagues, and even your competitors. If you've been waiting to catch up on what's been going on, here's your chance. Better hurry." 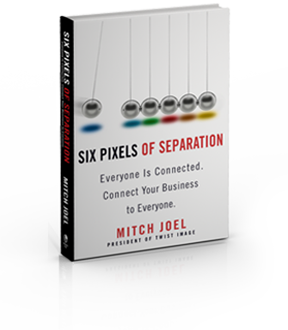 "A first-rate debut by Mitch Joel, Six Pixels of Separation shows us how our world of commerce has changed, using real-world business examples and written with the entrepreneur and business person in mind." "Whether you are a Fortune 500 CEO, an entrepreneur, or a college kid dreaming about starting your own business, Six Pixels of Separation is an essential road map to our intricate and complex social connections. Mitch Joel helps us understand this emerging world, and turn its force into our ally." "Social media in all forms are becoming the dominant form of interaction on the Net, whether blogging, Twittering, Facebook, LinkedIn, etc. Six Pixels of Separation clearly describes this new family of media, offering realistic ways to get involved and productive in a hurry." Six Pixels of Separation - Ask “Why?" The transition of all industries into the fully-digital future leaves everybody caught in a middle ground - it's not heaven, it's not hell, and it's very confusing. Businesses and employees are not sure where things are headed or what they must do to survive and thrive. In short, this is a time of purgatory. In CTRL ALT Delete, Mitch Joel provides a roadmap for business and professional success through this purgatory. It explains the convergence of five movements that will change business forever, identifies seven triggers that will help individuals take advantage of those movements, and shows all readers how to make the necessary reboot - in effect, how to CTRL ALT Delete. Divided into two sections (Reboot: Business and Reboot: You), CTRL ALT Delete explains five key movements, with examples from companies that are successfully making the right shifts, and also shows how individuals can move from just doing a job to doing the work that they were meant to do. While Mitch's first book, Six Pixels of Separation, was about how (and why) new media had changed business forever, CTRL ALT Delete answers the question "now what? "; Now that everyone is on social networks, sharing and conversing, how do you pivot your business to capitalize on just how much our world has changed, and get the edge on where all of this is taking us? CTRL ALT Delete will help you navigate out of our business purgatory. "In CTRL ALT DELETE, Mitch Joel surveys the ways technology has transformed how brands and businesses create, connect, and adapt to a shifting new landscape. This book--and especially the five new movements he identifies that are forcing brands to reboot--is an indispensable read for a time when so much is in transition." "The way we work and do business is changing faster than most of us understand or can comprehend. Fortunately Mitch Joel has given us CTRL ALT DELETE, a wonderful book full of his invaluable insight to help us navigate, adapt, and survive these fundamental changes. "In CTRL ALT DELETE, Mitch Joel shows us that in times of great uncertainty--like ours--flexibility, creativity, authenticity, and kindness are the keys to developing great businesses--and ourselves. His book is a wonderful guide through the new terrain." "In his new book, Mitch Joel describes how you must strive to adapt, to learn, and to stay ahead of the curve online. This book will help prepare you for the future . . . now!" bestselling author of Delivering Happiness and CEO of Zappos.com, Inc.
"Writing with his signature blend of warmth and intelligence, in CTRL ALT DELETE Mitch Joel delivers a crucial blueprint for running your business--with humane intention and razor-sharp results." "Too many brands, in their frantic effort to fashion a new business strategy, fail to build meaningful relationships with the customers they serve. Even fewer understand the new business landscape as it is (not as it once was). They need to listen to Mitch Joel. CTRL ALT DELETE is a wise and practical road map that can help you navigate today's challenging economic, social, physical, and digital landscape."